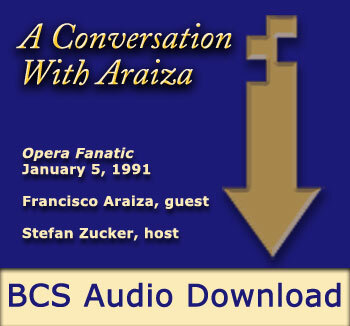 Listen to Araiza on Corelli, Björling, Di Stefano. “The interviewees are often critics or singers, but they are always knowledgeable. Zucker has interviewed Franco Corelli eleven times, Alfredo Kraus, Carlo Bergonzi, Franz Mazura, Louis Quilico and Francisco Araiza (twice), among many others. The interviews range from serious discussions of technique to hilarious anecdotes. They are like un-put-downable books; you can’t stop listening. Zucker, a singer himself, is a supreme musicologist–though not a stuffy one–who really knows the field and the right questions to ask. “Very little music is played on some of the nights he has interviews. During one of the Araiza interviews, there was no music at all. Can you imagine conducting a four-hour interview and sustaining total interest? Zucker can do just that. “Another two interviews that I cherish were with Schuyler Chapin, a year apart. Chapin is former General Manager of the Metropolitan Opera and at various points in his career an executive with Columbia Artists, Columbia Records and Columbia University (strange coincidence there). He’s a Guy-Who-Knows-Everybody-Who’s-Anybody in the music world…. Have you yourself ever been booed? If you had Corelli’s voice, what would you do differently? I once wrote that in the early 19th century no one produces his voice as you do, with the locus of resonance in the front of the face. Would you compare Luis Lima, Peter Dvorsky, Richard Leech, Neil Shicoff and yourself? Richard Leech shouldn’t be singing Samson. If you had to take a God’s eye view of Francisco Araiza?